This is my first tutorial, so be patient with me, and if you have a question….please ask it! I would love some feedback from this. So I recently discovered something called ‘Wonder Under’. (Wonder Under is just a brand name, and actually not even the brand that I bought, but I keep calling it Wonder Under the same way most Texans call all sodas ‘ Coke’, or people who don’t play video games call all game systems ‘Nintendo’.) I had heard of it, but thought it was just a tool to use when you couldn’t use a sewing machine to make a hem. And it does come in strips so you can avoid sewing hems, but it also comes in big sheets, and that is what we will use today. 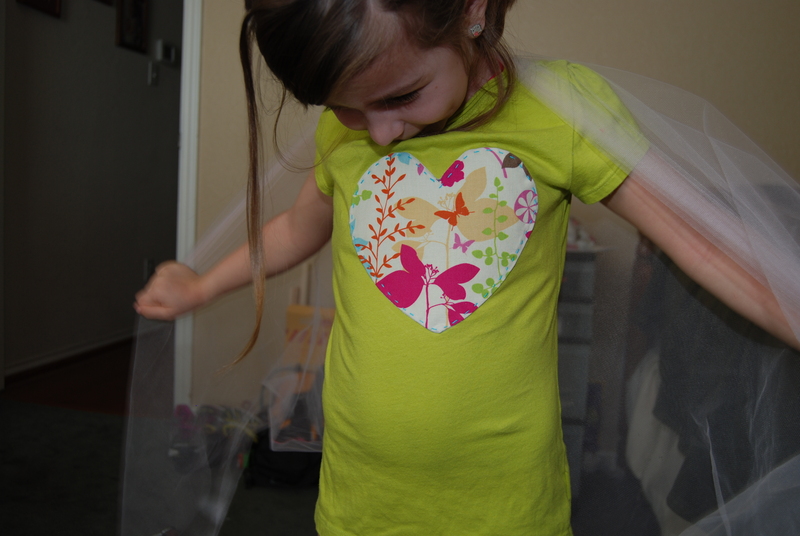 First, you need to figure out what you want to put on the shirt. It could be a letter of the first name, a simple shape, anything really. 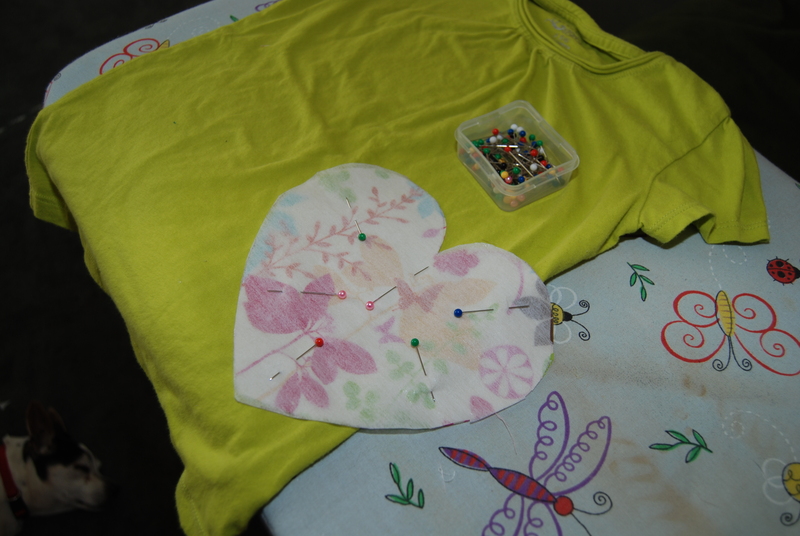 I think for a first project though, maybe pick something easy like a simple shape: square, triangle, heart or circle. Either draw or print out your picture, then cut it out. 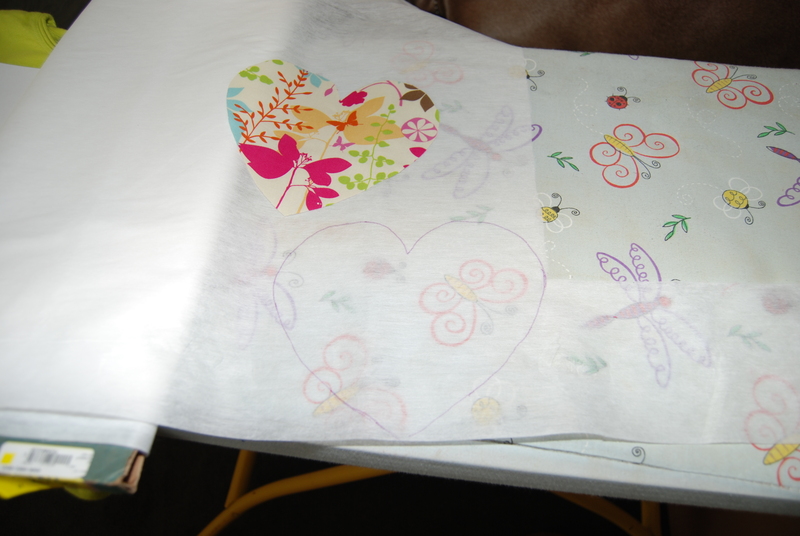 Trace it onto your fabric (I would use a disappearing ink pen, or chalk), cut it out of your fabric, then cut one out of your interfacing. 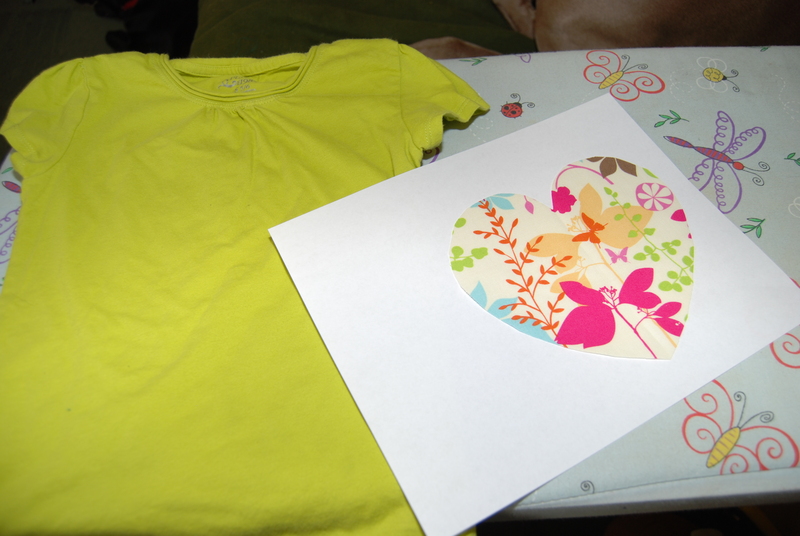 (note: if you want your picture to have raw edges and fray, don’t worry about the interfacing, just skip that part). 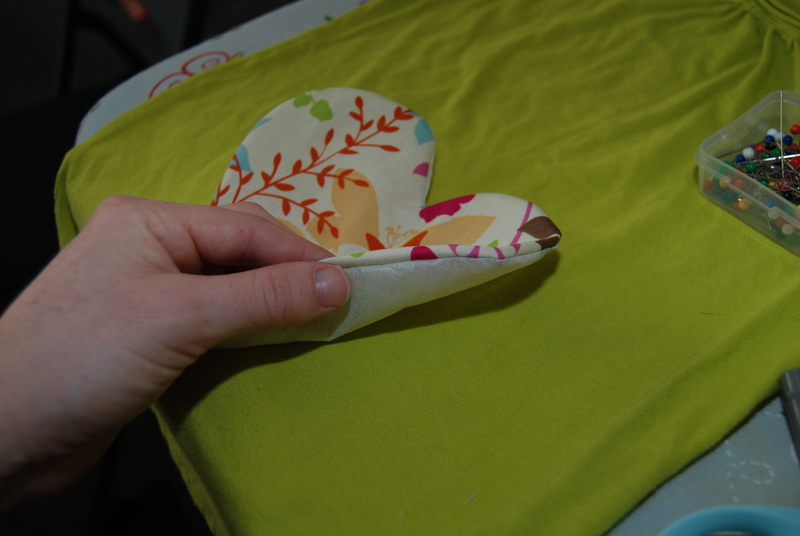 Pin your interfacing to the right side of your fabric, then sew all the way around the edge. Try to get close to the edge. I line mine up with the inside of my presser foot. 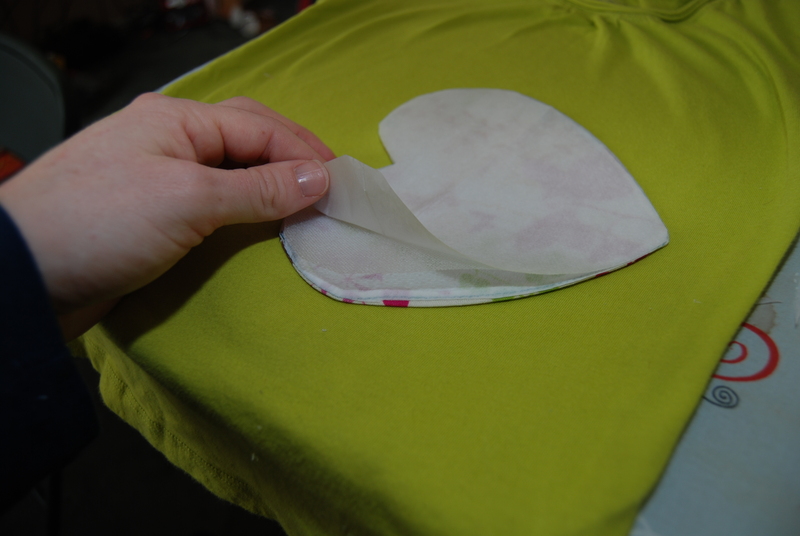 Now cut a small slit in the interfacing, and flip your shape inside out. Run your fingers along the inside of your shape, pushing out all of the edges and trying to get them to be as smooth as possible. 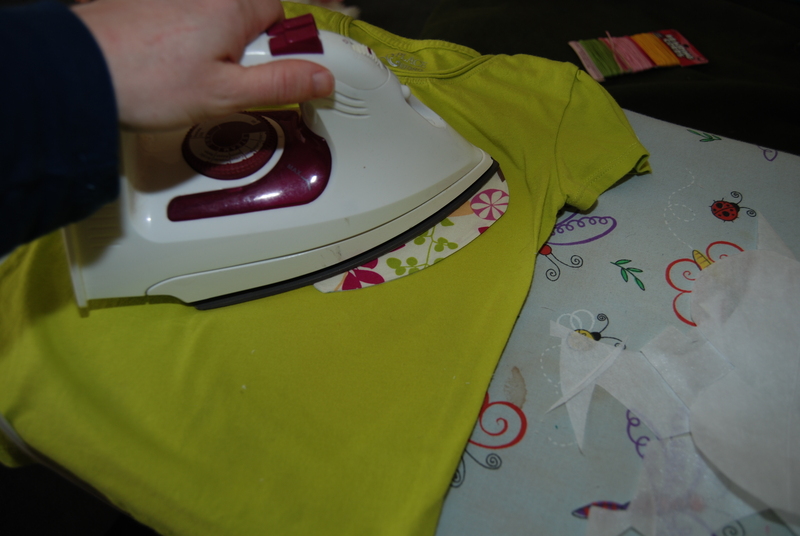 Then iron it flat. Next, trace your shape on to your Wonder Under, cut that out. I’m not sure if all brands are like this, but mine is sticky on both sides, but you can easily pull it off the fabric. 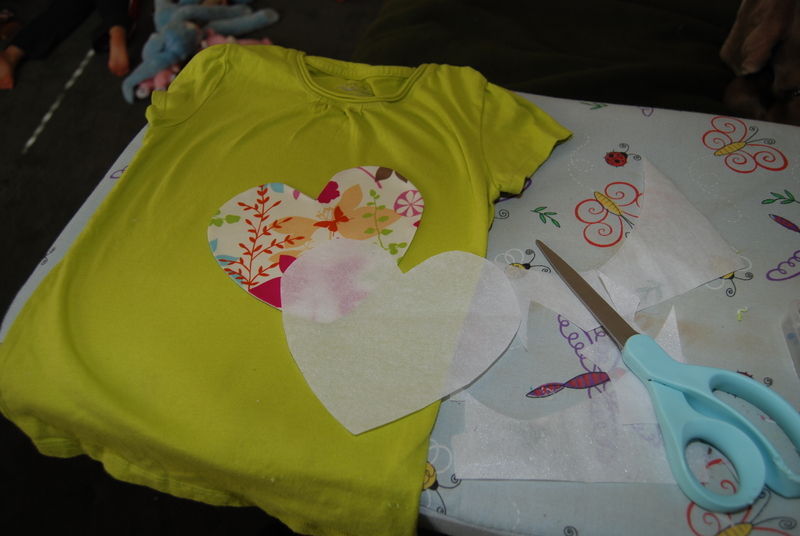 So after you cut it out you can stick it to the fabric and make sure they line up just right, and if they don’t, trim the edges a bit. Once you have the fabric lined up on the wonder under, peel the back paper off, and stick your design wherever you want it on the shirt. You can stick in one spot and test that out…if that doesn’t work for you pull it up and try another until you are happy with it. Once you have it in place, iron it on. Read your instructions! Mine says to iron it on cotton setting for 15-20 seconds. You can tell around the edges if it has worked or not, but in the middle it’s a little harder to tell. Just be sure to iron it at least as long as the instructions say, and then maybe a little longer just to be sure…just don’t burn your fabric! Now look!! 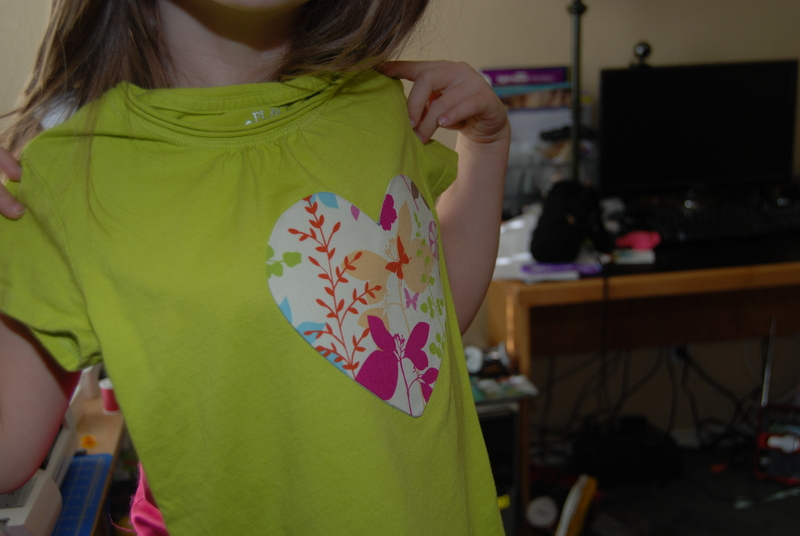 We have taken a plain shirt and made it something special 🙂 My daughter was thrilled with it like this, but I am not done yet. I like the look of hand embroidery, and since it was one of my New Year resolutions to try, I am going to embellish my design by hand. You could also stitch around it on your sewing machine, or glue millions of little plastic crystals to it, or if you have a bedazzler…..then bedazzle that thing!! 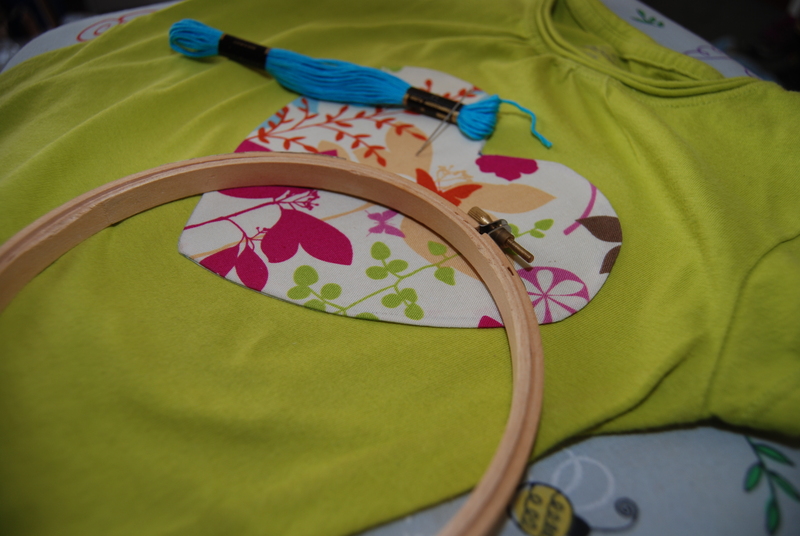 A couple of tips for hand embroidery…1. Don’t sweat it if it’s not perfect, that’s the beauty of doing something by hand…it’s like a fingerprint or handwriting, it’s uniquely yours. 2. 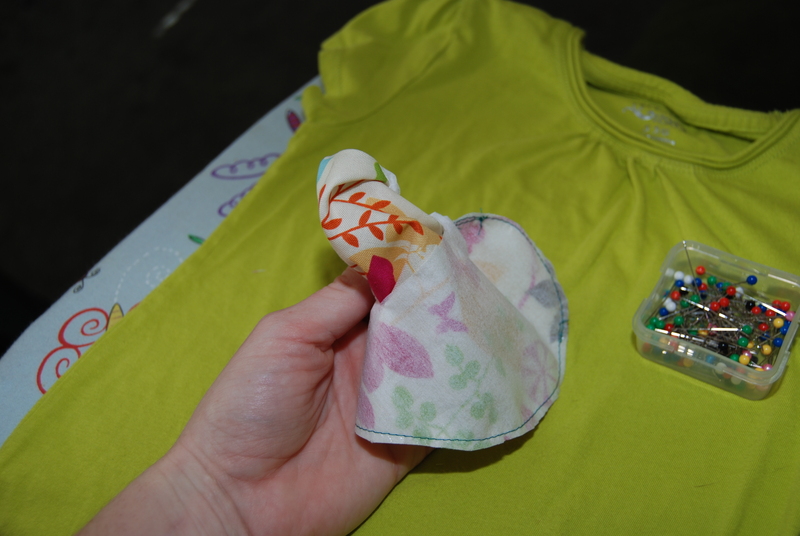 Use a thimble, it will save your fingers! 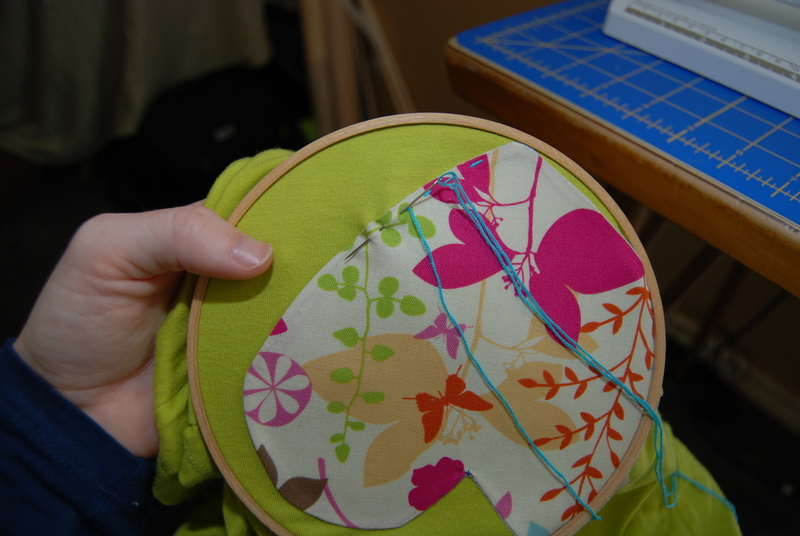 Pushing a needle through layers of fabric is tough on fingertips. 3. Get a hoop. 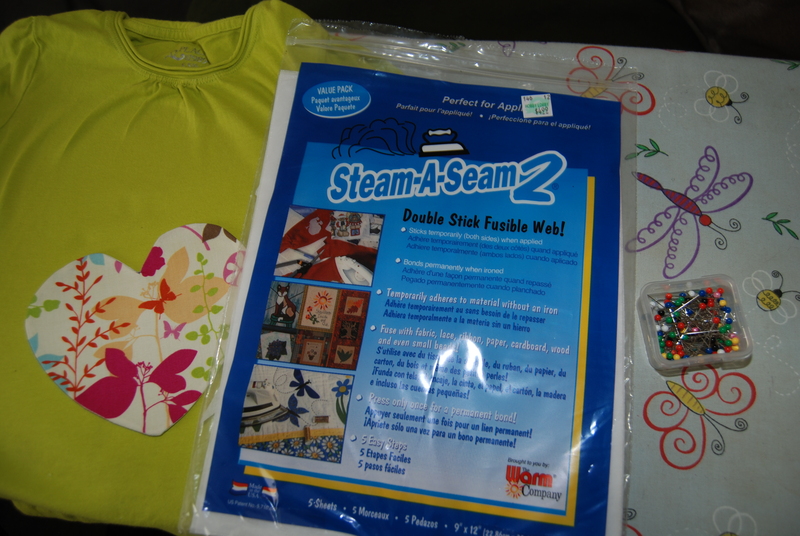 They are super cheap, and makes embroidering anything a million times easier. 4. If you have never hand embroidered, or sewn anything by hand take a second to google hand embroidery….I learned from my Grandmother years ago, but I used Youtube.com as a refresher. Once you are done you can sit back and enjoy your handy work. 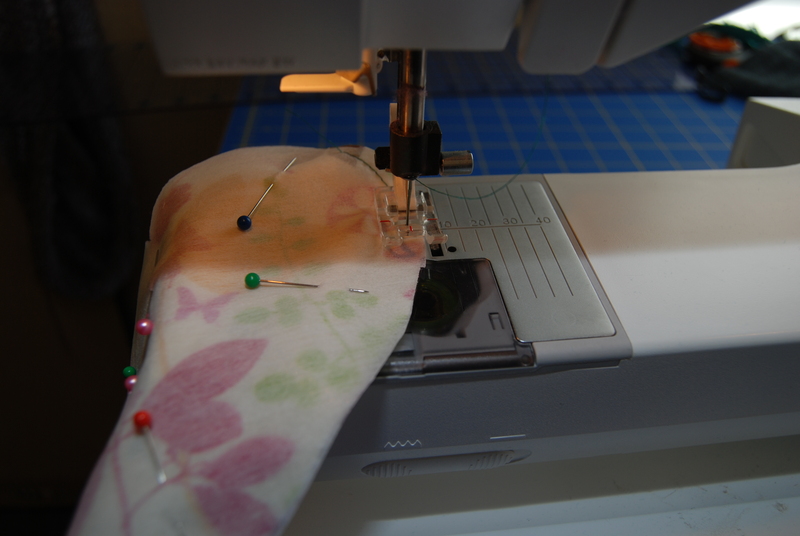 If you don’t sew you can still do this…just omit the interfacing, or sew that by hand. I think it would be cute to have a frayed look around the edge. The wonder under stuff claims that it will stay put forever, wash after wash, but I never trust that and usually sew some kind of stitch around the outside. Hope this was somewhat of a help, or at least a stepping stone to get you to try something new. Let me know if it worked out for you and maybe you could share your creations with me! If you have any questions at all, just leave me a comment. I wish that I had thought to look for wu for Steven’s batman costume….his was such a nightmare. It looked awful!